It used to be I could make a selection with Marquee Tool, then make a path with Pen Tool, then in Paths hit “Load Path as a selection” - and the selection and the path would intersect as a new selection. This doesn’t work for me anymore, tried “add to selection”, “subtract from selection”, this gives either just the path as selection or subtracts the path from the selection. Path Tool does a strange thing. When the path is turned into selection, the selection is inversed, i.e. I make a triangular path, turn it into a selection and expect the inside of the triangular shape will be active, instead it is the outside of the triangular shape that is active. This is opposite of what I was used to. Something is rotten in the state of Denmark, any help? Maybe check if your pen shape mode is set to Combine Shapes. Not the answer you're looking for? Browse other questions tagged adobe-photoshop path or ask your own question. 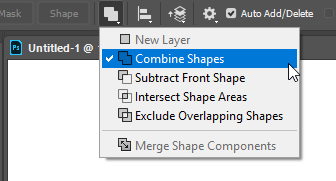 Can someone please explain non-trivial behavior of Direct Select tool while attempting to resize a rectangle in Photoshop? How to mask a layer with shapes in photoshop? Photoshop using Marque Tool > Path > Circular But Not a perfect shape? Photoshop CS3 > Marquee Tool > Modify > Contract problem? Photoshop CC 2017 - Why is lasso tool cropping image when used in Select And Mask?